This article is about the town in North Lanarkshire, Scotland. For other uses, see Bellshill (disambiguation). The earliest record of Bellshill's name is handwritten on a map by Timothy Pont dated 1596 although the letters are difficult to distinguish. It's possible it reads Belſsill with the first s being an old-fashioned long s. The site is recorded as being east of "Vdinſtoun" and north of "Bothwel-hauch" (which confusingly is above "Orbeſton" on Pont's map). The name can also been seen on another map, which was derived from Pont's work, made by the Dutch cartographer Joan Blaeu where the place is called "Belmil". The village consisted of a row of quarry workers' houses owned by Mr. Bell, who owned a stone quarry to the south of Belmill. Charles Ross' map of 1773 has "Belsihill" marked north of Crosgates and Orbiston. About 1810, this new settlement took on the name Bellshill and continued to grow. It absorbed nearby villages such as Nesnas, Black Moss and Sykehead. Bellshill was on the road which linked Glasgow and Edinburgh. According to the first Statistical Account, in the late 1700s the parish of Bothwell, which encompasses modern Bellshill , was a centre of hand-loom weaving with 113 weavers recorded. Only 50 colliers were listed. A hundred or so years later, these occupations had changed places in degree of importance to the area economy. With the introduction of new machinery in the mid 19th century, many cottage weavers lost their livelihood. Demand for coal to feed British industry meant that by the 1870s 20 deep pits were in operation in the area. The first mine to open (and the last to close in 1953) was the Thankerton mine. Others followed swiftly and rapidly increased the size of the town, even attracting a steady stream of immigrants from abroad, particularly Lithuania, so much so that the town is sometimes referred to as 'Little Lithuania'. The rise in the migrant Lithuanian population led to the opening of The Scottish Lithuanian Recreation and Social Club within Calder Road in the Mossend area. Iron and Steel production were also central to the development of the town. J. B. Neilson, developer of the revolutionary 'hot blast' process, opened the first iron works in the area (Mossend Iron Works) in 1839. During the industrial boom, a number of railway stations were situated in the area, including Mossend, Fallside and Bell Cross. The settlement is now just served by Bellshill railway station. In the 1870s, Bothwell Parochial Board built the two-ward Bellshill Hospital. During World War I, the hospital specialised in infectious diseases. In 1917, the hospital began to change focus to become a maternity hospital, the first in the Lanarkshire area, with new dedicated maternity buildings being opened in 1958 and 1962. The hospital was also the first in the world to have an 'Obstetric Flying Squad'. It was the birthplace of many famous faces including politician Robin Cook, footballer Ally McCoist and singer Sheena Easton. The hospital was closed in 2001 and demolished in 2003 to make way for new housing developments. According to a report by the Halifax Building Society, in the first quarter of 2005 Bellshill was the UK's property hot spot with a 46% rise in house prices. This took the average property price to £105,698 (according to reports published April 2005). In 2006, a new mosque was opened in the Mossend area of Bellshill becoming one of the largest mosques in Scotland. The streetscape project, a plan to regenerate and modernise the town centre, commenced Apr 2007 and was completed nearly three years later. The project, created a one way system on the main street with more space for pedestrians. Bellshill once had 6 primary schools including Belvidere Primary School. This was closed, however, in early June 2010 and has now been demolished. Holy Family Primary School was founded in 1868 and moved to new buildings in 1907 to accommodate an influx of Lithuanian, Polish and Irish Catholics seeking work in the area. Other primary schools include Sacred Heart Primary, Mossend Primary, Noble Primary, St. Gerard's Primary and Lawmuir Primary. There are two fairly large secondary schools, Bellshill Academy and Cardinal Newman High School. 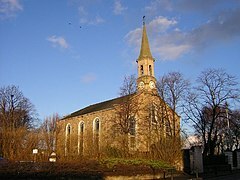 Historically a Relief Church for 1000 people was built in Bellshill in 1763. Today several churches serve the town. St Andrews United Free Church of Scotland sits at Bellshill Cross whilst the Church of Scotland Parish Churches are at opposite ends of the Main Street with Bellshill Central Parish church opposite The Academy, and Bellshill West Parish Church next to the Sir Matt Busby Sports Centre. The town's Roman Catholic Parish Churches are St Gerard's, Sacred Heart & Holy Family, Mossend. There is a free public library within the Bellshill Cultural Centre. Various singers, such as Sheena Easton, and sportsmen hailed from the town. Even before the growth of Buckfast, Bellshill had a reputation as a hard-drinking town. Bellshill is also known for its music, especially since the mid-1980s. Bands such as the Soup Dragons, BMX Bandits and Teenage Fanclub put Bellshill on the map as an indie rock hot-spot in Scotland. The scene - known as the Bellshill Sound or the Bellshill Beat - was celebrated by influential DJ John Peel in the Channel 4 television series Sounds Of The Suburbs. Bellshill continues to produce well respected and influential independent pop music, with members of Mogwai hailing from the town. Sheena Easton was also from the town, and attended Bellshill Academy. Bellshill was home to Lanarkshire's maternity hospital. The following list refers to notable people who were born in the town. The town has a football team, Bellshill Athletic, that plays in the Scottish Junior Football West Premier League. They play their home games at Rockburn park after moving away from Tollcross, Glasgow, after New Brandon Park was closed down to reduce costs. Bellshill also has the Sir Matt Busby Sports Complex (Named after the late Manchester United legend who was born and brought up in the area) that opened in 1995. It has a 25m swimming pool, with two large spectator seating areas either side, a large hall and health suite. The complex also has a gym and a dance studio. There is a golf course next to nearby Strathclyde Park. The Greenlink Cycle Path also travels through the golf course and the Orbiston area of Bellshill, heading towards Forgewood. ^ "Key Facts 2016 - Demography". North Lanarkshire Council. Retrieved 3 January 2018. ^ "Glasgow and the county of Lanark - Pont 34". Maps of Scotland. Timothy Pont (16th century). Retrieved 31 December 2017. ^ "Bellshill on Pont's map no. 34". National Library of Scotland. Retrieved 6 January 2018. ^ Blaeu, Joan. "Glottiana Praefectura Inferior". National Library of Scotland. Retrieved 30 December 2017. ^ "1986 - BELLSHILL AND MOSSEND". BBC. Retrieved 31 December 2017. ^ "County Maps". National Library of Scotland. Retrieved 2 January 2018. ^ "Six Inch Maps". National Library of Scotland. Retrieved 2 January 2018. ^ "25 inch O.S. Map with zoom and Bing overlay". National Library of Scotland. Ordnance Survey. Retrieved 30 December 2017. ^ Lewis, Samuel (1851). A topographical dictionary of Scotland, comprising the several counties, islands, cities, burgh and market towns, parishes, and principal villages, with historical and statistical descriptions: embellished with engravings of the seals and arms of the different burghs and universities. London: S. Lewis and co. p. 123. Retrieved 2 January 2018. ^ Macculloch, Michael (1795). The statistical account of Scotland. Drawn up from the communications of the ministers of the different parishes (Vol 16 ed.). Glasgow: Dunlop and Wilson. p. 304. Retrieved 2 January 2018. ^ a b Wilson, Rhona (1995). Bygone Bellshill. Catrine, Ayrshire: Stenlake Publishing. p. 3. ISBN 9781872074597. ^ Wilson, Rhona (1995). Bygone Bellshill. Catrine, Ayrshire: Stenlake Publishing. p. 4. ISBN 9781872074597. ^ "Lithuanians in Lanarkshire". Legacies: UK history local to you. BBC. Retrieved 6 January 2018. ^ Fisher, Jack (1995). Old Bellshill in pictures. Motherwell: Motherwell Leisure. p. 47. Retrieved 30 December 2017. ^ Mort, Frederick (1910). Lanarkshire. Cambridge: Cambridge University Press. p. 152. Retrieved 30 December 2017. ^ Groome, Francis Hindes (1895). Ordnance gazetteer of Scotland: a survey of Scottish topography, statistical, biographical, and historical. London: W. Mackenzie. p. 140. Retrieved 31 December 2017. ^ "Google Mosque Map - UK Mosques Directory". mosques.muslimsinbritain.org. ^ "1986 - EDUCATION". BBC. Retrieved 31 December 2017. ^ Fisher, Jack (1995). Old Bellshill in pictures. Motherwell: Motherwell Leisure. pp. 39–40. Retrieved 30 December 2017. ^ "1986 - COMPREHENSIVE EDUCATION". BBC. Retrieved 31 December 2017. ^ Gardiner, Matthew (1845). The new statistical account of Scotland. Edinburgh and London: W. Blackwood and Sons. p. 800. Retrieved 31 December 2017. ^ "Church celebrates 140th anniversary". Motherwell Times. 11 January 2018. Retrieved 13 January 2018. ^ Lewis, David (1885). The drink traffic in the nineteenth century, its growth and influence. London: National Temperance Publication Depot. p. 14. Retrieved 30 December 2017. Wikimedia Commons has media related to Bellshill.